Although we have lots of wrecks and other great dive sites in the surrounding area, the house reef is one of the most popular dives because of the nudibranchs and other critters. Thanks to favourable topography, water currents, plentiful nutrients and several depth levels, our magic house-reef offers many different habitats and an astonishing array of marine life. If you’re into finding and photographing critters, the house reef will be your new favourite place. Our house reef at Gulen Dive Resort has the highest documented nudibranch species count anywhere in the Atlantic Ocean. Among our contributions to science are the discovery of the species Gulenia orjani, Gulenia monicae and Fjordia chriskaugei, all of which were published in November 2017 along with a major revision of the family Flabellinidae. 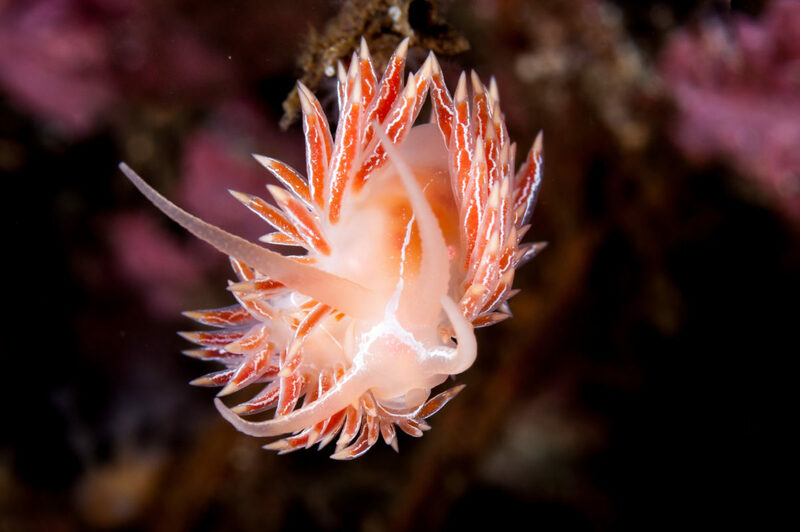 In total, we have found a staggering 73 species of different species of Nudibranchs, så you are welcome to explore our kind of muck diving! You can dive throughout the year with slight variations in viz, but favorable periods has very good visibility up to 30 meters + in the winter months Water temperature is highest in August with up to 22 Celsius and lowest in March with 6 celsius. We have several options and packages we can offer you. And can easely do changes if needed. Use our feedback form (you will find it below)and send us som words about how many days and how many dives you are considering and we will get back to you shortly.